Spendthrift? 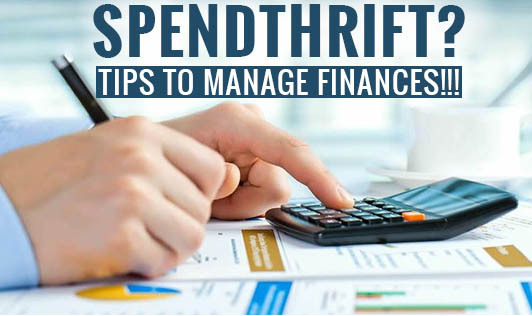 Tips to manage finances!!! • Cash only- Carrying cash while you go shopping will prevent going overboard. Leave your credit and debit cards at home so that you will spend within the limits. • Set your goal- Set your savings goal to change your spending pattern. Also make up your mind to spend your saving on the things you were eyeing for from long like a vacation or a car or jewelry! • List your items- Avoid coming back home with big fat shopping bags, most of which were not preplanned. Always make a list of items that you need to buy so that you will not only save money but also save time! • Categorize your spending- Decide and divide your spending to different categories like shopping, dining out, groceries, clothing etc and keep envelops with money for all of these. Once the money in envelop is over, stop spending on that category. • Allow indulgence- Do you have a new item added to the wish list? Allow yourself some indulgence but again set the limit. Remember to take it from the envelope kept exclusively for indulgence or the left over from other categories can also be used up! Learn to distinguish between needs and desires and keep in mind your affordability. If it is worth blowing up your savings, then know the demerits also.